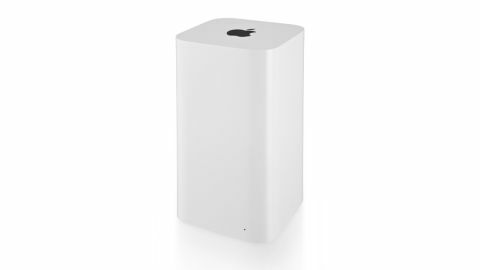 The Apple Time Capsule gets a new case design and support for the new 802.11ac Wi-Fi standard, but other than that it's almost identical to its predecessor. Like the fourth-generation Time Capsule, it has a 2TB or 3TB hard disk inside, and makes it easy to back up multiple Macs at the same time over Wi-Fi or Ethernet. It doesn't improve on its predecessor's arguably stingy three Gigabit Ethernet ports. Also similarly, it has simultaneous dual-band 2.4GHz and 5GHz wireless - so that a slower, older device joining the network doesn't slow it down. There's still a USB port through which you can share a printer or hard disk, and support for guest internet access. It's set up with an easy OS X or iOS utility. The new design and extra antennas are meant to eke out better performance, and if you're connecting 802.11ac devices wirelessly, it can shape the signal better to target them. In our real-world testing scenario, the increase was less noticeable than promised. Transfer speeds are fractionally better when using 802.11n than the last generation, but even with the 802.11ac MacBook Air, the write speed to disk only doubled to a little over 10MB/sec in our deliberately tough testing. The 3TB model is now cheaper. But you can also get all this with a new AirPort Extreme, if you attach a hard disk to its USB port.